There are hundreds of unique knots out there for every use under the sun. 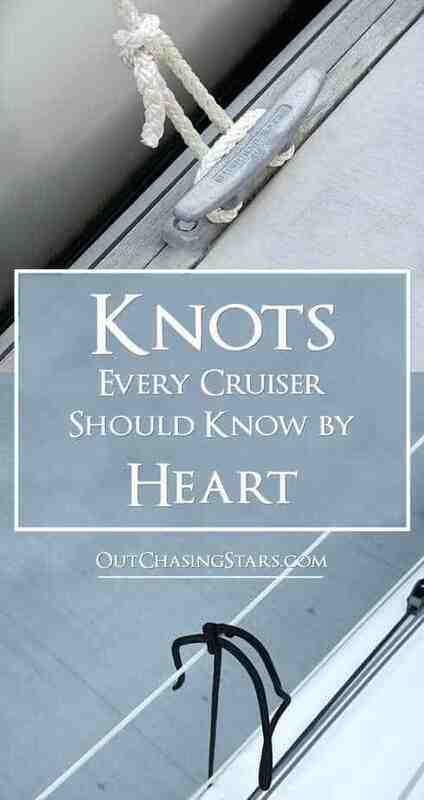 But, after 3 years of cruising, we have found that there are only 3 important knots for cruisers to know by heart. Learn the, use them, love them. This is hands down, the number one most important knot to learn. The bowline is a quick and easy way to put a loop in any line. We use it on our lead sheets, on our dinghy painter, while docking…pretty much all the time. Friends of ours taught us how to tie a bowline one handed, a skill they learned from scuba diving. 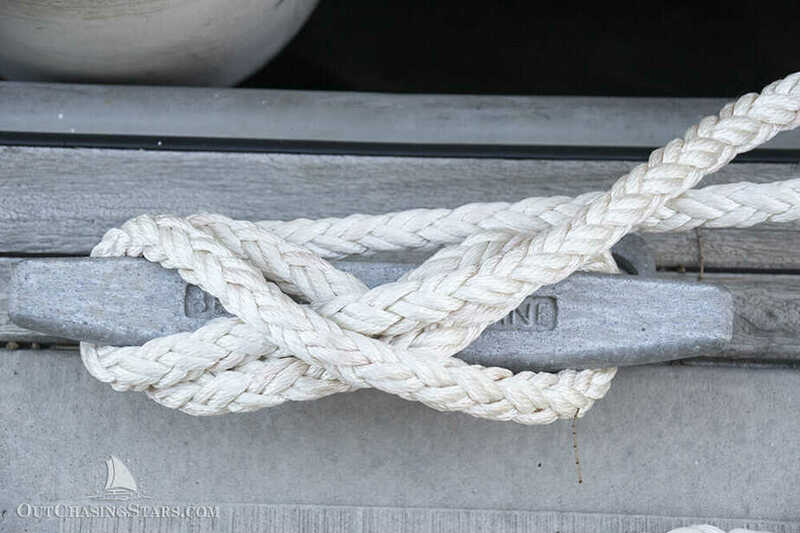 All of our dock lines have a bowline on one end. It boggles my mind that some boaters don’t get this one right. The most important part is the LOCKING hitch! Make sure you get the hitch in by putting the tail of the line under the figure eight. This prevents the line from coming undone. In fact, we often do two hitches. I’ve even had line handlers at fuel docks not put a locking hitch in and when the line is pulled against, it comes undone. The last important knot for cruisers to know is the clove hitch. When you are putting your fenders out, use this knot to make it easy to adjust your fenders on the fly. With the quick release, one tug reduces the knot to a simple wrap around the lifeline, and then you can pay out or take up the line as needed to get your fender height just right. 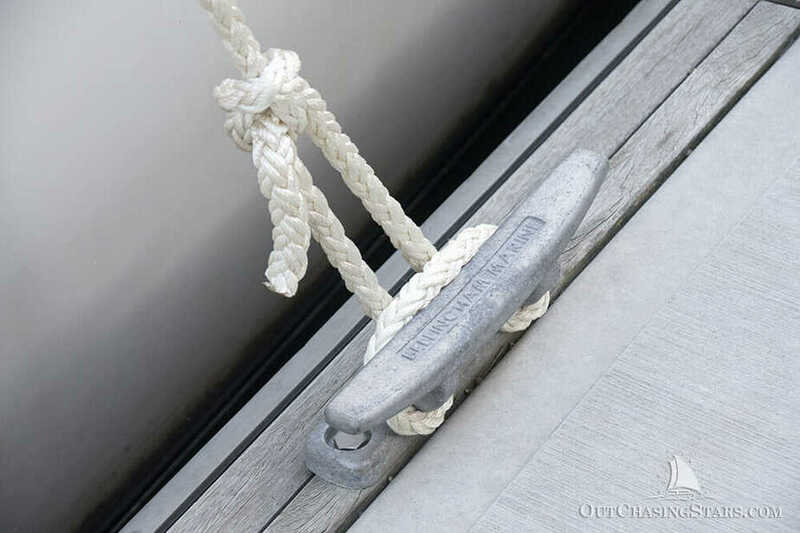 I’ve seen boaters fiddle with fenders and struggle with getting them to the right height easily, and this knot is the solution. The clove hitch with a quick release. One tug on the loose end and you can adjust the height of your fender. 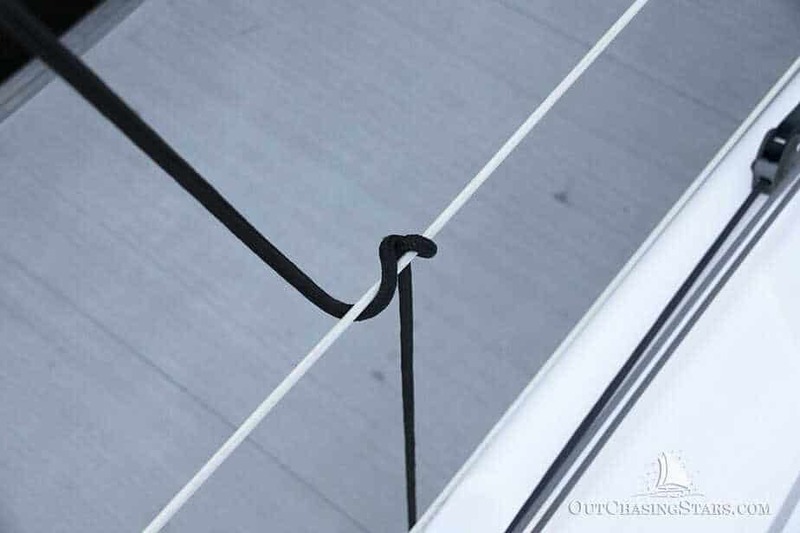 Without the quick release, the clove hitch is a great knot for tying up to a bollard or post. In this case, there’s no place to make your figure eights for a cleat hitch, and there’s also no way to get a loop over the top of the post. There are a TON of knots out there, but in three years of cruising, the three knots above are the ones I’ve needed to know quickly and from rote. 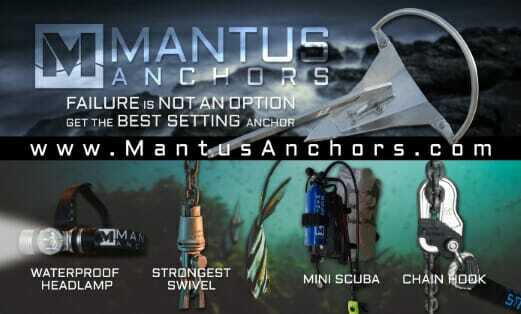 We’ve used dozens of other ones throughout the boat, some extremely complex like a monkey’s fist or alpine butterfly loop, and some really simple like lashings. But, our essential kit is still the three above. Make sure you practice these knots and be prepared to use them at a moment’s notice. Animated Knots by Grog is the best app and website to have a library of knots at hand all the time. 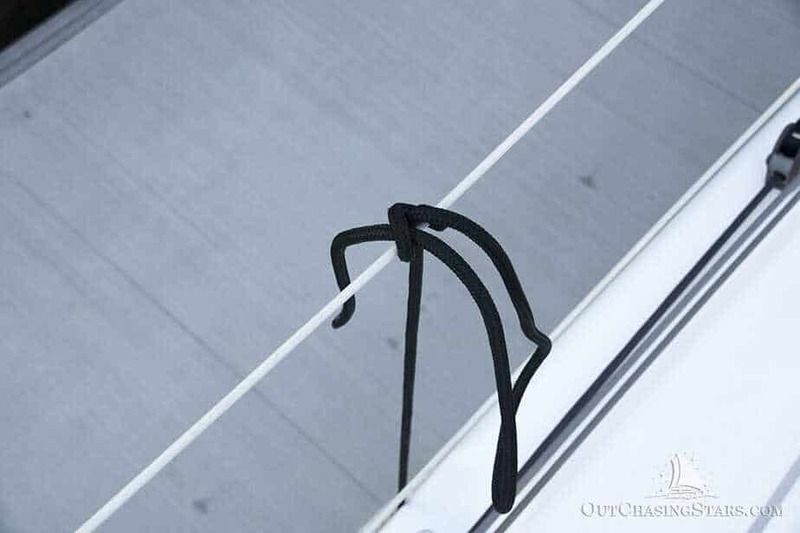 Six Knots Sailors Should Know by the ASA – while the important knots for cruisers would be slightly different than for sailors, it’s a good perspective. Hey Clive, interesting idea. From an energy perspective, that’s a tough question to answer. I haven’t done any calculations to determine how efficient our 110v water maker would be in comparison to a 12v unit so I can’t speak to how that would compare to a UV filter. My guess would be that a UV filter would be more efficient. However, a UV filter might help reduce smells generated from dying marine organisms, but it still wouldn’t remove the problem of calcification build up that results from the interaction of salt water and human urine. So you’d still likely have to replace hoses sooner and that build up may hold more smells anyways. 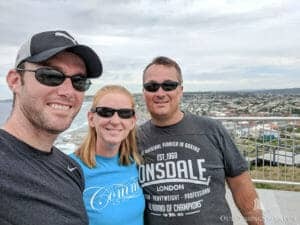 If you do give it a try, be sure to let us know how it goes!